The annual old boys’ dinner at the Marine Court Hotel is nearly here. Numbers are already looking very promising for Friday 10 November, with several Year Groups already hitting double figures. Take a bow, as ever, the Classes of 1951 and 1975, joined this time by, and celebrating 25 years since their departure from BGS, the Class of 1992. Indeed, there’s every likelihood the Class of 1992 will secure the title for best Year Group attendance but with more than two weeks to go anything is possible. What about the Class of 1997, marking 20 years since tossing their proverbial caps in the air, or, for that matter, the Class of 1967, which achieved such a splendid turnout for their 50th anniversary dinner at the School in early June? 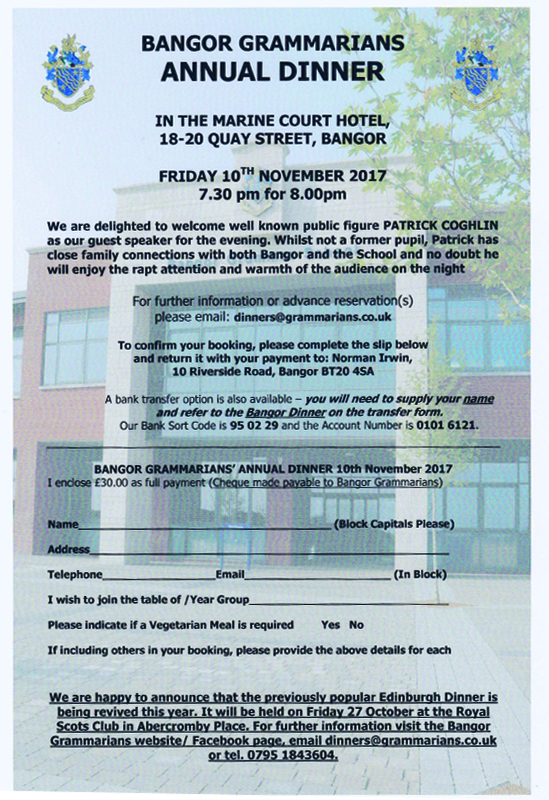 Any and all Year Groups and individual past pupils, plus past and present staff members, are very welcome at the dinner. All the details can be found on the attached form. Please forward it to your friends and help to make this a dinner to really remember!